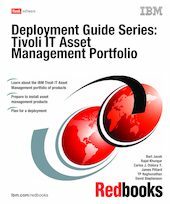 This deployment guide provides information related to the deployment of the products that make up the IBM Tivoli IT Asset Management portfolio of products. Thes products include IBM Tvioli Asset Management for IT, IBM Tivoli License Compliance Manager, and IBM Tivoli License Compliance Manager for z/OS. The Asset Management for IT product is based on the Maximo Asset Management product for managing enterprise assets. Specific functions are provided that are targeted to the needs of IT asset managers. The Tivoli License Compliance Manager and Tivoli License Compliance Manager for z/OS are complementary products that specifically address the discovery and management of the software being used in an enterprise and the management of the associated licenses. In the first part of this book, we introduce IBM Service Management and describe how IT asset management is a critical component of service management. We then provide more detailed information about each of the three products and guidance about their installation and deployment. Finally, we provide a high level overview of how to plan for an engagement for the deployment of an IT asset management solution. This book is for people interested in IT asset management.